Your contribution matters. We rely on private support from people like you who have committed to being part of the solution to homelessness. We offer an attractive return on your investment — measured in terms of human lives and futures. Any amount that you can give will go a long way toward helping the homeless. No donation is too great or too small. A $1,000 donation can support a household in Supportive Housing for one month as they transition back to stability and self-sufficiency. A $500 donation can satisfy the immediate, temporary need for food and a safe place to sleep for 50 people for one night. A $100 donation can help keep a family's utilities connected. A $20 donation can provide state-issued identification required for an individual to obtain employment. Join a community of supporters who are solving homelessness with their monthly gifts to Housing Forward. Your steady support helps us sustain the six integrated programs with which we served 858 people last year. Monthly giving is easy for you, and we appreciate the reliability of your gift -- especially given the current uncertainty of many of our public funding sources. For credit card pledges, simply click on the button above and choose the second donation option - "To make recurring donations - Click 'Create Profile'." After you create your profile, you can choose your monthly donation amount and the day of the month on which you want your credit card to be charged. To change the amount of your monthly donation at any time, return to this page, click on this button and log into your account. For pledges to be fulfilled by check or cash, or if you have questions, call or email our Director of Development (708.338.1724, ext. 262, jgow@housingforward.org). 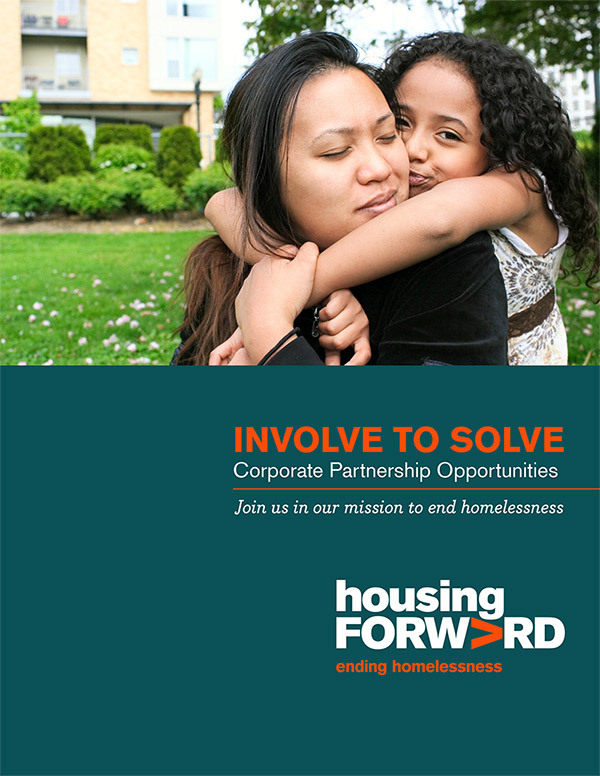 Housing Forward believes that corporate partnerships should be mutually beneficial. We understand that contributions to your community must be balanced with the needs of your shareholders, customers and employees. In addition to the social responsibility and goodwill aspects of a potential partnership, Housing Forward recognizes our Corporate Partners among our donors, civic leaders and citizens of the communities we serve. Download our Corporate Partnership PDF for opportunities for annual giving with year-round recognition for your investment in our mission. Donate appreciated assets (stocks, mutual funds, ETFs) and get a tax deduction for your gift. For your convenience, Housing Forward has an established brokerage account to accept Depository Trust Company transfers of securities. Contact Gregory Bork at LPL Financial (312.967.4000 or gregory@RIGChicago.com). Account #1897-8327. DTC#0075. To arrange a delivery of donated items email Etta Martin at etmartin@housingforward.org or call 708.338.1724 ext. 220 to schedule a drop-off. We accept unarranged donations (through the new entrance door on 9th Avenue) on Tuesdays between the hours of 9am and 4pm. Donations on days other than Tuesdays need to be by appointment by calling or emailing Etta. Please call 708.338.1724 ext. 220 to schedule the drop off of your donation. Your donation of the items on our General Wish List (Download PDF) will help clients in our PADS Shelter and Support Center as they work toward their goals. Of the items on the list, there is an immediate need for *NEW* men's, women's and children's underwear, backpacks/bags, toiletries, boots and shoes. It's hard to say "no thank you" to a donation. However, if an item is not in clean, usable condition, the costs of handling, storing and/or disposing of the item diverts funds that would otherwise support our clients. Specific guidelines are listed in our Donation Acceptance Policy (Download PDF). Thank you for supporting our mission to transition as many people as possible from housing crisis to housing stability! Make a tax-deductible donation to our annual fund and help build a brighter future for hundreds of people. Click on the secure DONATE NOW button above. Mail your check, payable to Housing Forward, to 1851 S. Ninth Ave., Maywood, IL 60153. Call 708.338.1724 (ext. 262) and ask for Janet Gow, Director of Development & Communications, or email her at jgow@housingforward.org. Housing Forward is an Illinois not-for-profit corporation qualified under 501(c)3 of the Internal Revenue Code. FEIN #36-3876660 and DUNS #79-822-9725.